8. I love coming home to see Spring in our yard. 9. I made a broth out of a salmon head, green garlic, lemon, half a white onion, julienne ginger, 1/4 stick of butter, 2 tablespoons or so of the arugula pesto, and water. 10. The Husband and I sat outside on the patio this afternoon sipping a bowl of the soup along with munching on crunchy, salty potato chips. Missy Girl decided to join us as we slurped the last drops. 11. Do, re, me. 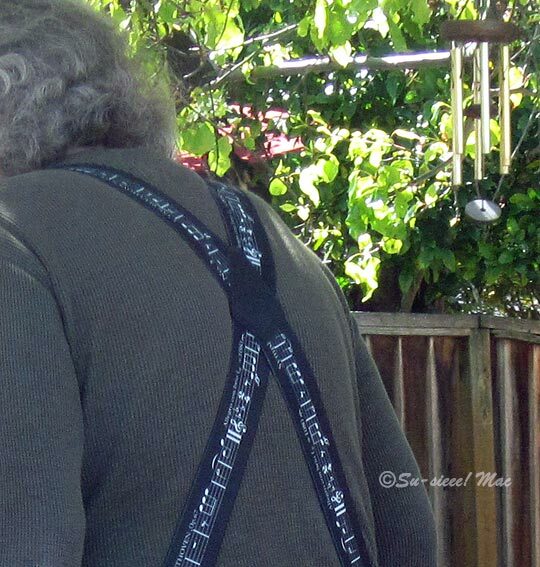 The Husband looks mighty cute in his suspenders of musical notes. 12. 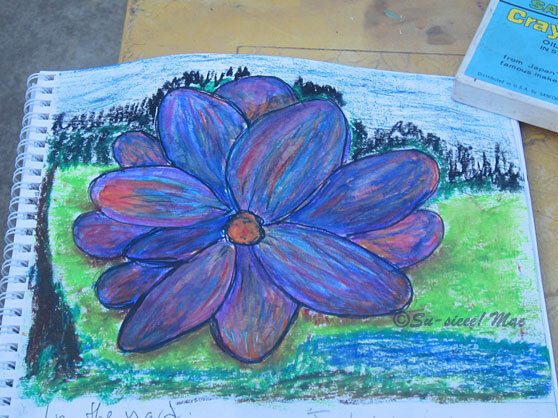 A 13-petal tumble blossom came out of my imagination this afternoon with the tools of water color pencils, oil pastels, and a fine-tip pen. 13. 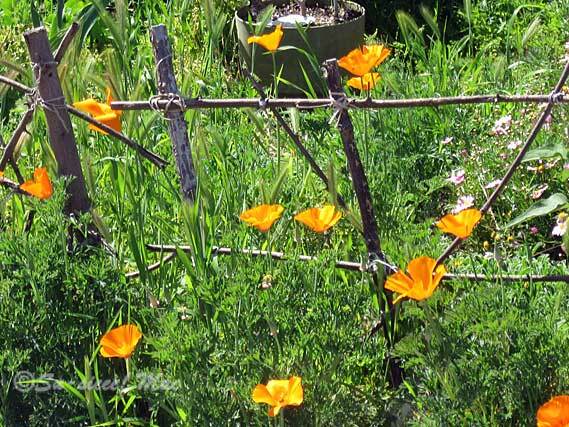 Volunteer golden poppies: It's Spring! It's Thursday, so I'm heading over to Thursday 13 and I Like Thursdays. Come join me. Thank you, Dear Hosts! So many musical chairs. So much to celebrate! Talk about a Spring Cleaning! We're even addressing the spider webs. Love your front yard and love seeing it since it is gloomy, grey and we have sleet right now. Love to see a picture of the old organ and hope it goes to a good home. It's weird weather patterns all over. I have no idea what's normal anymore. Hope you get some blue skies soon. A most excellent list! :) . . . what's the tune on the Husband's braces? Widders, he says the tune is Beethoven's 5th. I love the profusion of flowers in your yard! I love this post! I am a caramel corn lover for starters...a product called Crunch n Munch cannot come in this house! 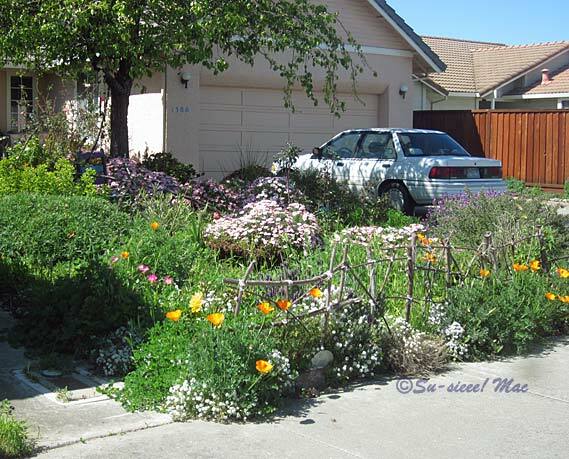 Pleasurable to see the summery look in your yard and yes to poppies that just reseed like that. Sipping homemade soup outside!! I don't know why it takes time to get the house sorted out like that...same thing here. And a big yes to exercising your creativity. I completely enjoy the story of YOU . . Thank you for sharing. Happy Spring! Oh those poppies! and your yard .., and the fish/green garlic broth sounds light and perfect for early spring. ... I wish I could find a nice spot for all the electronic paraphernalia. Hey ya Sallie! The fish broth was inspired by a seafood pasta dish I had a couple days before. Oh my gosh the broth was so tasty. The only difference between the restaurant's and mine was that the chef used white wine in his. Roy Rogers wasn't wide enough for all the electronic stuff. Fortunately, cables were able to stretch so the DVD player was set on a nearby bookcase. I wonder where the tumble blossom will tumble, maybe lavender fields to show off its colors. You're making fish head soup, now I can't get that song out of my fish head, rolling polly fish head. I think our springs look nothing alike (is that a word, it looks funny at 1 in the morning). You have an 1800s organ in your house, what else you got in that bag, Mary Poppins? Springs--boing, boing. That has me thinking of box springs, springs in old sofas, and how my hair boings about when I get a perm, which I think about doing one more time. Yesterday we drove around a new neighborhood in which the developers graced every yard with purple flowers. I couldn't tell what they were. I think they were drought resistant. I wouldn't mind pulling out an umbrella from my pocketbook that lets me fly. your garden is looking lovely, spring is on it's way, and it sounds like life is good. Enjoy, have a fabulous week, and thankyou for visiting my blog last week.